NEEDING COLOR IN THE LANDSCAPE THIS TIME OF YEAR? Here we are in mid-January. Compared to last year, this January has been more typical for us when it comes to temperatures and snow. Yes, we had snow this past weekend. But, it was nothing compared to the snow we had in December. And, snow helps insulate our plants and gives our plants a slow watering when it melts. The bottom line is that I have no complaints about winter so far. Adding color to the landscape can be challenging at this time of the year. Yes, pansies and violas will keep blooming all winter long. If you haven’t planted pansies or violas up to this point, you can still plant and enjoy seeing them in bloom. We still have a decent selection of pansies for you to choose from outside our nursery. But, what else will flower you may ask? Consider planting Hellebores. This evergreen, hardy, shade-loving perennial is just getting “warmed up” in the garden. My hellebores are just beginning to bloom in the landscape. And, the cold snap and snow this past week has had no effect on this plant. So, to add some winter color and interest to your shade garden you need to look at the hellebores. We have a good selection of assorted hellebores at this time in the nursery that are in bloom or soon to come into bloom. One of the most popular and easiest to grow are the Oriental hybrid hellebores. Their common name is the Lenton Rose because they bloom around the beginning of Lent. The Lenton Rose blooms in a variety of colors including green, cream, pink, and maroon. We carry many HGC hellebores. HGC stands for Hellebore Gold Collection. The HGC collection included many varieties of hellebore niger and other hybrids and they are propagated by division and not by their flower seed. By propagating from division it guarantees the variety identity. Each HGC variety must pass stringent criteria before they are received into the collection. 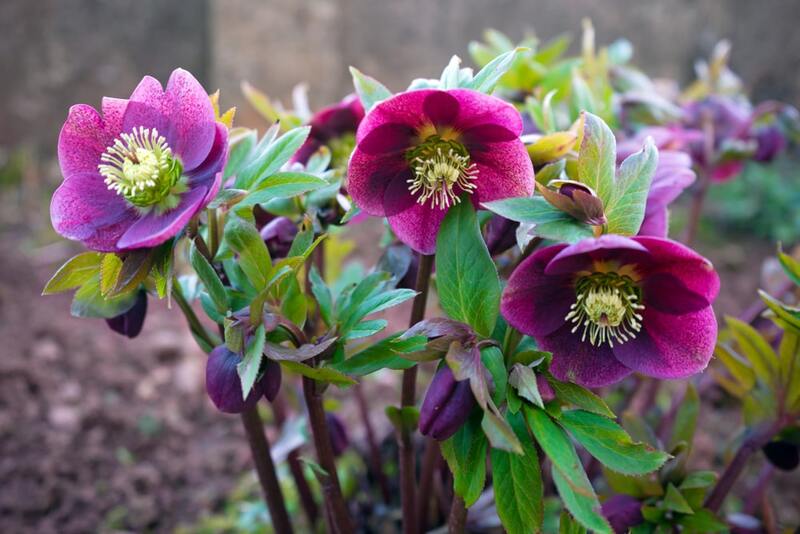 To ensure healthy hellebores means planting it in the right location and with the right soil amendments. As I have been stressing, hellebores are shade loving. They also require a well-draining soil that is rich with organic matter. So, my suggestion is to add some Leaf-Gro compost to the soil. And, add some Espoma Bio-Tone inside the hole at the time of planting. Bio-tone is an amazing root stimulator for newly planted plants. Once planted, hellebores are rarely bothered by insect or diseases. In fact, even the deer tend to ignore these early-blooming beauties. You may sense from my writing that hellebores are one of my favorite shade-loving perennials. Well, you may be right. I also love having ferns in the garden, especially the Autumn Brilliance variety, because it is also an evergreen, hardy perennial. Hellebores and Ferns are good companion plants. Once they are planted correctly and in the right location, hellebores have little to no maintenance to grow and thrive. Over the years, as the clumps become bigger, hellebores are easy to divide and separate. Thanks for the information on hellebores. I have a few 2 I’ve had for 5/6 years. They are definitely a favorite of mine. Hi there! Great article! When can I plant this sweet plant outside? I purchased one a month ago and it looks pretty bad. Most of the leaves have turned brown and I cut them back. It is flowering. Should I repot it? Help! Hellebores blooms are one of my favorites and they are a low maintenance plant. Can they be planted right now or do they need to go in the ground when it’s warmer? Glad you liked this blog on hellebores. If you are planning to plant it then I would do so as soon as possible. The fact that it has some brown leaves is ok for now. It will grow new leaves this spring. Enjoy the blooms. They are beautiful! Marlene, Glad you read my blog on hellebores. They are low maintenance, gives us color in the ‘dead’ of winter, and deer do not bother these plants. How can you go wrong in planting some in the landscape!